If you are completely new to the world of welding, it can be defined as a method of joining and melting together two or more pieces of metal or other materials such as thermoplastics through the use of applied heat and pressure. For a little historical context, the practice originated in the Middle Ages by way of a relatively crude method called “forge welding,” in which fire was used to heat metal objects until they became malleable enough to hammer together. 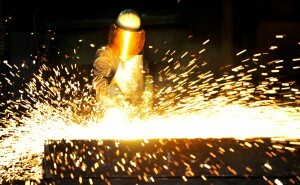 That changed by the industrial revolution, when a faster, safer method using electric or gas-flame tools was developed. Today, a number of different welding methods are commonly used. Let’s take a look at some of them. Popular due to its low cost, arc welding devices produce an electric current that can pass through even non-conductive materials. The name comes from the often archlike shape of the current. This process dates back to 1802. 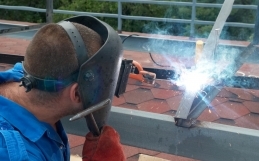 A form of automatic welding favored for projects that need to be done quickly. Because of its versatility in terms of types of materials and uses that it’s suitable for, it’s great for efficient work on construction sites. 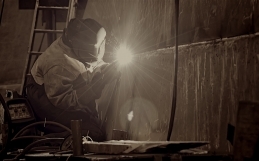 A more difficult, time-consuming process than most forms of welding, this method requires great skill and control, because of the tiny amount of space that must be maintained between the flame and the materials being welded. Done well, it produces very durable, quality welds. Used for joining large objects together such as thick steel plates. The devices for this method are designed to weld objects in an upright, vertical position, and are named for the water-filled copper chambers they contain, which keep slag from dripping freely as it liquefies. 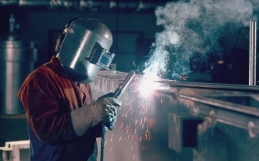 In this method, a gas is employed to shield the material being welded in order to prevent it from being affected by oxygen and other natural elements of the environment. It enables welders to work quickly at a smooth, continuous clip. Basically the same method as used in Gas Tungsten-Arc Welding, but it employs a different sort of torch. 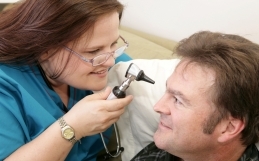 It enables very detailed work on small areas. Also called “stick welding,” this manual process is one of the most widely used in welding. It’s inexpensive and tends to be messy, often resulting in molten splatter. Commonly used on construction sites on steel structures. Mainly used on metals such as stainless steel, which have high iron content. A fairly speedy process, given that it can be done in automatic and semi-automatic methods, the electrical arc needs to be covered or submerged continually by flux, a chemical purifying agent, to protect the metal as it is being welded. For other related articles check out our blog.